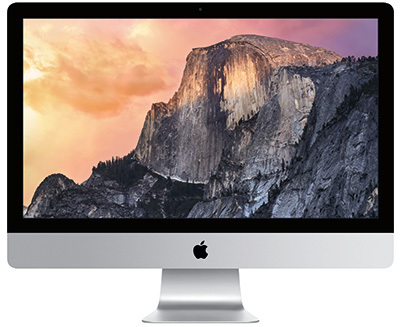 Though masquerading as a humble 27-inch iMac, Apple unleashed a monster this week: a new 5K iMac. Named the “iMac with Retina 5K Display,” it delivers 67% more pixels than a 4K display: 5,120 pixels across and 2,880 pixels high; 14.7 million pixels! (14,745,600 to be exact). NOTE: The starting price is $2,499, which provides a very nice system. Configured for maximum productivity, the price is a still-reasonable $3,599. From an engineering point of view, this is an amazing monitor at a very attractive price; especially when I can remember HD video monitors costing upwards of $20,000. What I don’t know as I write this is which color space these calibrators are using and whether we can trust the colors on the screen for critical video work. For web video and, most likely, photography, I’m sure this monitor represents most colors well. However, for more critical video work, I need to learn more about how this is calibrated. Remember that new-and-improved Timing Controller mentioned above? This puppy needs to pump out a LOT of data to feed full-frame, high-frame-rate video to 14.7 million pixels. In fact, it requires so much bandwidth that the current DisplayPort 1.2 standard can’t support it. This is why there’s no separate 5K display – we don’t have any connection on the Mac that’s fast enough to get the data from the computer to the monitor. As fast as Thunderbolt 2 is, it is too slow to support monitors this big. I expect that to change with upcoming standards such as DisplayPort 1.3 and Thunderbolt 3. However, for now, 5K is limited to just this system. It is a fact of physics that if monitor size remains the same while pixel density (resolution) increases, then the size of each pixel must get smaller. As pixels get smaller, the text displayed by the application should also get smaller. But, here, Apple is doing something clever. On the new iMac with 5K Retina display, if you run the system at “Best for Retina” resolution in System Preferences > Display, the physical size of onscreen objects (for example, text and buttons) is the same as the non-Retina 27″ display. This is because Apple has created an invisible “grid” that overlays the on-screen pixels, not just for this computer, but as part of their overall OS development system. Developers create their user interface using coordinates on this grid. This means that text sizes don’t change, even though pixel density does. This keeps interface elements looking consistent, while the increased pixel density of the 5K iMac makes everything look sharper and higher resolution. NOTE: For comparison, this behavior is similar to the 15″ MacBook Pro with Retina display as compared to the previous generation 15″ MacBook Pro without Retina display. If you don’t need the extra pixels, stay with the existing 27″ iMac. The only reason to step up to this system is for the extra screen resolution. The entry system is very nice for people that need more pixels but don’t need to move them around very quickly. Still photographers come first to mind. Add more RAM, but not from Apple. Look at companies such as: OWC, Kingston, or Crucial. Personally, I like the 1 TB Fusion drive a lot because it does a nice job of balancing performance and storage space with cost; so I don’t generally recommend upgrading to other options. I have it installed on two of my new iMacs and find its performance excellent. Its integral SSD drive gives me speed for repetitive tasks and the 1 TB hard drive means that I have internal storage as well. NOTE: A Fusion drive combines both SSD and standard spinning media into a single unit. The SSD is 128 GB in size and is programmed to store the portions of the OS, applications and data that you use the most. This accelerates your most common tasks, while still providing lots of extra internal storage if you need it. Keep in mind that for all media work, I ALWAYS recommend storing projects and media on a second drive – ideally, a RAID 5 system, if your budget permits. I only use the internal drive for the operating system, applications and temporary files. Excluding the cost of RAM, which varies by vendor, the new configured price of the iMac is $2999.00, excluding AppleCare and tax. This is still an amazing price. 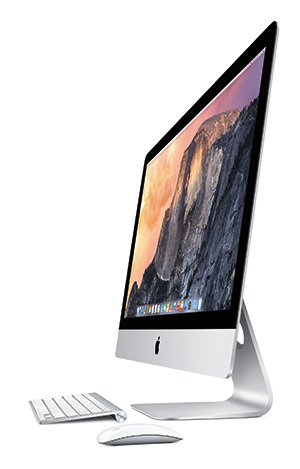 I really like the current crop of iMacs and, from what I read, the 5K iMac fits very well into that family. However, my strong recommendation is to see one of these in person at an Apple Store, run the applications on it that you commonly use, and see how it looks. If you are primarily text and menu based, you won’t need the increased resolution this system can provide. If you are primarily looking at images, rather than menus and text, this is a great system. If you are shooting 2K video or smaller, this system may be overkill. If you are shooting 4K video and above, this is a very inexpensive way to see all the pixels in your image. It is always nice to have choices. Have you heard anything about the newly announced USB Type C connection? From my understanding this connector has the capacity to run one 5K monitor or two 4K monitors? This connection is supposedly coming on systems later next year, at least from what I’ve been reading. I’ve read about this connector and appreciate its reversibility. However, it is not the connector that determines the data transfer speed, but the protocol that runs over it. Which is why DisplayPort 1.3 is so important to high-resolution monitors. ANSWER: It has 2 Thunderbolt-2 Ports. This means it can supoort two external monitors up to 4K each. QUOTE: What I don’t know as I write this is which color space these calibrators are using and whether we can trust the colors on the screen for critical video work. For web video and, most likely, photography, I’m sure this monitor represents most colors well. ANSWER: Professional Photographers are even more critical of colors on the screen than Videographers. After all, a single 40″ Studio Quality Photo has to have exactly the right colors. If this works for professional photographers, then it will work for videographers also. QUOTE: Personally, I like the 1 TB Fusion drive a lot, so I don’t upgrade to other options. ANSWER: The 1 TB PCIe SSD is twice as fast for the entire storage size. This is highly recommended versus a Fusion drive. The new iMac is faster in many uses than the 6-Core Mac Pro. The 5K Monitor makes it a lot of fun for Final Cut Pro X users. Thanks for your comments. My wording was poor when I wrote that it only supports one monitor – as many pointed out. What I meant – and have corrected this to read – is that this unit can’t be used as a second monitor due to bandwidth limitations. I don’t doubt that professional photographers are very picky about color. But I would still like to know more about how the color calibrators work, what color space this supports, and stuff like that. There is no doubt that SSD drives are faster. But, I like the Fusion drive combination of SSD with spinning media for performance, storage capacity and cost. Doesn’t support a 5k external because that would need DisplayPort 1.3. DOES support external display. Yup, my bad. I have cleaned up my writing to say that this can’t be used as a second monitor. This supports the normal complement of external monitors. NOTE that the new iMac CAN drive an external 5K Monitor – such as Dell’s $2500 5K monitor coming this December 2014 – by using two DisplayPort 1.2 ports simultaneously, driven by a Multi-Stream Transport driver. But we have to hope that Apple will create such a driver. This is what regular PCs have to do to drive the monitor. Such a driver will also allow the Mac Pro to use the iMac as an external monitor. Realize that NO BODY can drive any existing 5K Monitors otherwise, without DisplayPort 1.3 – which only came out last month as a specification. Thanks, Larry, for this extremely helpful article. 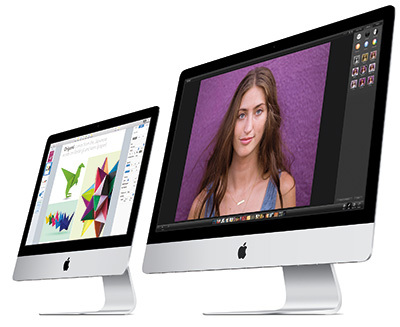 I would love it if in the near future, you can let us know whether one can run DaVinci Resolve Lite on this new iMac. I’ve tried it on my 2011 iMac, but get a message saying the GPU doesn’t support it. For what it’s worth, this machine looks amazing. I’d buy this (if I could) just to surf the web.